Almost 25 years to the day after the R.M.S. Titanic was discovered two and a half miles below the surface of the Atlantic, an expedition to the ocean floor has transmitted brand new images of history's most famous shipwreck. Legendary before it was found, the Titanic became even more so after the world caught its first glance of the ghostly ship, which met its end in April 1912. After years of speculation and educated guesses that had turned up nothing but empty ocean, researchers located the deteriorating bow and debris field on Sept. 1, 1985. Explorer Robert Ballard, an oceanographer and former Navy captain, had long wanted to find the wreck, first attempting the feat in 1977 to no avail. But it wasn't until 1985 that he would find a way to finance his research. Ballard approached the U.S. Navy for funding, which he secured on the condition of locating two sunken Navy submarines  the U.S.S. Thresher and U.S.S. Scorpion, both Cold Warera nuclear submarines  lost some years before. He was required to first find the submarines on the seafloor and photograph them (a secret mission that Ballard didn't reveal until 2008) before using the underwater robots to search for the Titanic. In the early hours of Sept. 1, Ballard, in conjunction with a French expedition, tracked a debris trail to the wreckage. Video and photographs were taken and later broadcast to the world. 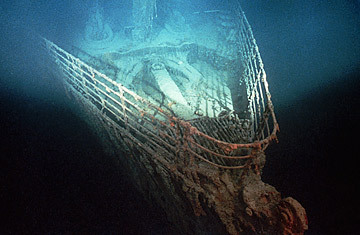 A year after the remains of the Titanic were discovered, more oceanographers went to explore the sections of bow and stern and the extensive debris field that lay between the two. In 1993, the company RMS Titanic Inc. (formed by Premier Exhibitions, which designs museum exhibitions and maintains artifacts) was named salvor-in-possession of the wreck, gaining the rights to collect found artifacts and launch expeditions to the ship. They did so seven times between 1986 and 2004, collecting over 5,500 artifacts ranging from china dishes to leather trunks filled with preserved bank notes. A section of the debris field even became known as "hell's kitchen" for the overwhelming amount of cooking utensils found there. Through photographs taken on subsequent trips, the company was able to reconstruct images of the grand staircase, later made famous (as were all things Titanic) by James Cameron's blockbuster film. The largest discovery was that of a 17-ton section of the hull. An attempt to raise it in 1996 failed when the hull was accidentally dropped back onto the muddy bottom. Two years later, the section was successfully taken to the surface and is now part of traveling exhibits across the country. The piece was temporarily displayed alongside a 16-ft. frozen aluminum block meant to represent an iceberg. Although observers couldn't touch the rusted metal, they were encouraged to hold onto the ice until they could no longer stand it, though "the people in the water that night didn't have that choice," John Zaller of Premier Exhibitions told the San Francisco Chronicle. Many argue that collecting items from the wreckage violates a sacred resting ground and that all the disturbances are causing the ship to deteriorate faster than it would if left alone. Others blame the multimillion-dollar expeditions  with their robots that land on deck and probe into small spaces  for causing regular and unnecessary damage. But those same expeditions have dispelled some of the myths surrounding what actually happened that night almost 100 years ago. Scientists recently discovered that the compartments were flooded due to several punctures (each less than a foot tall) in the hull, not one long gash as was originally believed. Regardless, time is running out for researchers, some of whom claim the wreck will not exist 50 years from now. As such, the new photographs come courtesy of a new group that is attempting to "virtually raise" the wreck in order to build a 3-D image before the ship disintegrates entirely. Ironically, the act of discovering the Titanic may be the thing that results in its final destruction. See a survival guide to catastrophe.